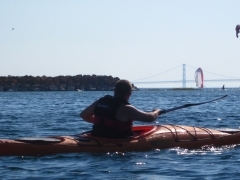 Each season, there are some great sailboat & yacht races which start at, end at, and pass through Mackinac Island's waters. 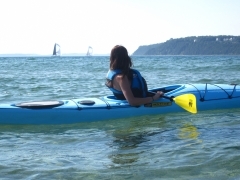 Watching boats sail across the finish line from a kayak is an incredible way to take in the sport. You get unmatched views that make amazing memories and photographs. Use the calendar below to find the race you want to see, and then schedule your kayak or SUP tour to watch them cross the line. These are typically some of our most popular tours - so book your reservation well in advance to secure your time! 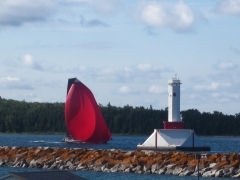 The Pink Pony "Fourth of July Sailboat Race"
Start of the Bayview Yacht Club & Bell's Beer 90th "Port Huron to Mackinac Island Race"
Mackinac Island "Round the Island Race"
Unfortunately the 2014 "MacMan" has been cancelled. 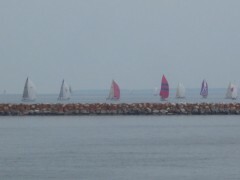 Start of the Chicago Yacht Club's 106th "Race to Mackinac"